Beautiful certificate from the Indiana Democratic Club issued in 1914. This historic document was printed by Goes and has an ornate border around it with a vignette of Lady Liberty. This item has the signatures of the Company's President and Secretary and is over 93 years old. American political clubs have a heritage as old as the Republic. The fundamental philosophical differences among our nation�s founders were reflected in the organization and membership of the Tammany Society and of the Cincinnatus Society. 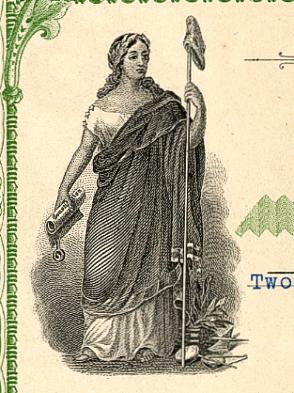 The political club movement developed in earnest during the 1880s. In honor of the Indiana governors Thomas Hendricks and Isaac P. Gray, Democrats organized the Hendricks-Gray Club to assist in the political campaigns. Evolving from the late 19th Century Democratic social organization, The Indiana Democratic Club, Inc. was incorporated on February 12,1901 by 82 prominent Democrats to promote �hope and harmony� among adherents to the party within the State. Since its inception, The Indiana Democratic Club, Inc. has counted many noted Hoosiers among its membership. The Club�s first President, John W. Kern, established a strong philosophical foundation upon which the club has flourished. John W. Kern, known as the Hoosier Progressive had a public career that spanned nearly 50 years of service in elected and appointed offices, including Democratic nominee for Vice President of the United States in 1908. He was twice nominated for Governor of Indiana and he represented the State in the United States Senate from 1911 to 1917. He served as Senate Majority Leader during President Wilson�s term. 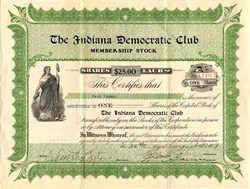 The Indiana Democratic Club, Inc. obtained general recognition during its second decade as a state wide organization under the Presidency of Fred E. Barrett. He gave his time, his study and his effort in promoting the Club, In addition to this work, Barrett served as Marion County Democratic Chairperson and Indianapolis� City Attorney. The success of the women�s suffrage movement provided new opportunities in the political life of Indiana and in the activities of the Indiana Democratic Club, Inc. Julia E. Landers, the first woman to serve on an Indiana precinct election board, served in turn as a club officer. She was elected by the membership to the position of Second Vice President. After Landers� service to the club, Alice F. McClulloch, Isabel Remster, Mayme Slack, and Alice F. Mullin were elected, in turn to this office. These and other advocates for women�s equality assisted the club through most of the 1920s. After sharing in the successful two decades of Democratic Party governance, The Indiana Democratic Club, Inc. fell upon difficult times at mid-century. Largely through the counseling and guidance of Lawrence J, Sexton, the club experienced a resurgence that carried it forward into the 1960s. Sexton was elected to seven consecutive terms as Club President and he was honored in 1961 as Mr. Indiana Democrat. Shortly after Sexton�s death in 1965, Ed Warren became the Club�s President. He guided the organization for nearly a decade as it experienced the adjustments resulting from the loss of Democratic party control at the local, state and national levels. Today, The Indiana Democratic Club, Inc. is building for the future. It offers for all Democrats a social framework rich in the history and tradition of the Democratic Party. The current President, Ken Kern, has been elected to thirteen consecutive terms.